Early this week, my colleague who's Chinese gave me half a dozen of meat buns which were actually siopao! When I declared it's siopao, he heartily agreed that it is indeed siopao and that many Filipinos like having it too, so it was no surprise for him that I was delighted to bring home some. Having the siopao reminded me that I still had some photos from past eats in the Philippines sitting in my hard disk that I have not yet published here. I found a couple, and wanted to share some of the side dishes I like. It was featured in Fear Factor, with the contestants grossing out over this egg dish. It's the century egg, something that I truly loved the first time I had it, and love it still. In fact, my officemates would automatically order century eggs when we're in a Chinese restaurant. Another side dish that they famously know I love is the jellyfish. Is it really jellyfish though? I wonder... The translucent strips are just plain crunchy! And then there's the infamous chicken feet! I was not actually truly fond of this dim sum (which, according to my research, is actually called Phoenix talons!) but my good friend Harry would unfailingly get a couple of orders - 1 for him, 1 for me. 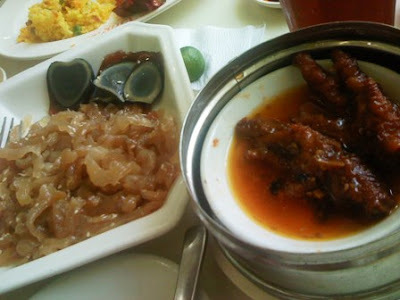 Chicken feet is not exactly exotic fare to me either; we've had chicken feet at home cooked adobo style. But pretty soon I have been ordering this for myself too! So make that three items on the menu that gets automatically ordered before the yang chow fried rice, the peking duck, the pork, the stir-fried veggies, and the hot tea. Speaking of dim sum, I once saw the plight of sharks that are caught and then, while they are still alive, their fins get sawn off, and then they are thrown off the boat to die. Sharks are on the brink of extinction and a worrying increase of attacks on humans in Australia notwithstanding, sharks still play an important role in the ecosystem. I wanted to be vocal about having shark's fin soup and shark's fin dim sum... but is it true that the shark's fin dim sum does not really have shark in it? Inspite of that, there's still the shark's fin soup to contend with, and I encourage you to keep off the items on the menu with "shark's fin" on it. I'm not really fond of soups because... well, being 90% liquid, it can fill you up quickly, and I love to do a lot of munching when in Chinese restaurants. But this hot and sour soup is soooo irresistible. My colleague Pauline loved ordering this for herself. I ordered one time for myself to check it out (plus the name is intriguing too!) and I loved it. Spicy and sour and hot all at the same time, with yummy bits of mushroom in it! 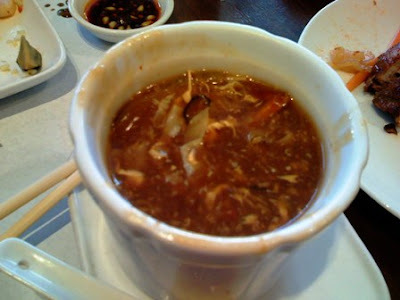 So when I do not have much choice for side dishes, I order the hot and sour soup. Great stuff.